384 Formerly Enslaved of William Lovett Balfour (1802-1857) & Family - who is nicka smith? Sharing a decade’s worth of research into 384 of the formerly enslaved of the Balfour family of North Carolina, Louisiana, and Mississippi. 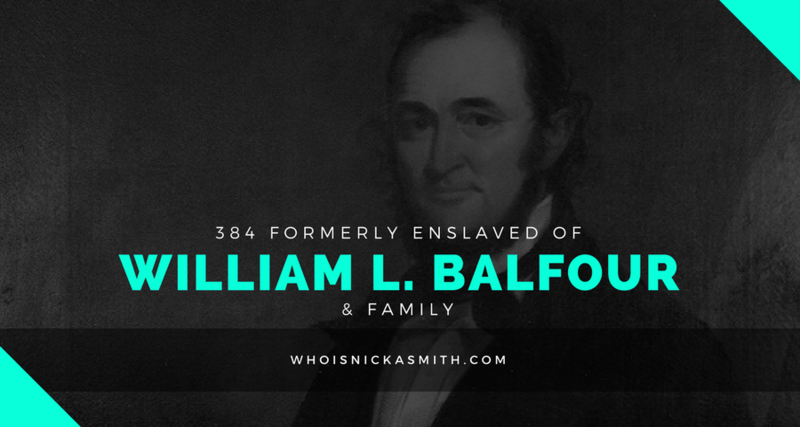 In 2005, I (along with my awesome research team) began researching the origins of William Lovett Balfour (March 25, 1802-May 8, 1857) as a potential slaveholder of my Atlas line. In the time since, we confirmed that Balfour was NOT slaveholder of the King Atlas, Sr., his wife Rachel Day, and their children John, King Jr., William Steven, Andrew and Mary. Despite this, we gathered A LOT of info on this family and their enslaved. To date, we have gathered information on 384 individuals who were formerly enslaved by Balfour and his family. At the time of his death in 1857, Balfour’s estate in just East Carroll Parish was worth $181,000 which, adjusted for inflation, is upwards of $4.7 million today. Records of Ante-Bellum Southern Plantations from the Revolution through the Civil War. Series G: Selections from the Center for American History, University of Texas at Austin, Part 5: Natchez Trace Collection— Other Plantation Collections. William L. Balfour Papers, 1841–1863. General Editor: Kenneth M. Stampp, Associate Editor Martin Schipper. Will and Codicil, Succession Record, Book I, 1857 – 1859, Page 1, William L. Balfour. Written: April 17, 1857, Recorded: June 3, 1857. 10th Judicial District Of Louisiana Courts, East Carroll Parish Clerk Of Court, 400 First Street, Lake Providence, LA 71254. Inventory, Succession Book I, Page 4, June 8, 1857, Estate of William L. Balfour of Madison County, MS. 10th Judicial District Of Louisiana Courts, East Carroll Parish Clerk Of Court, 400 First Street, Lake Providence, LA 71254. Mortgage Records, John B. Byrne to Wm. L. Balfour, Book B, Page 294-295, transaction: November 13, 1841, East Carroll Parish Clerk Of Court, 400 First Street, Lake Providence, LA 71254. Mortgage Record, W.S. Balfour to J.B. Byrne, Book D, Page 154-157, transaction: November 12, 1846, Recorded March 8, 1848, East Carroll Parish Clerk Of Court, 400 First Street, Lake Providence, LA 71254. There was no use in keeping the information for these folks on a hard drive. I KNOW there will be someone who is so close to getting the info they need on their ancestors and it may be in my hands. The table below is sortable, searchable, and can show up to 100 rows at a time. If you have questions regarding any of the notations, holler at me below. Also, if you think you’re connected to this family through slavery or perhaps through DNA, I’d also love to hear from you. Remember, I’ve been tracing them for over a decade, so I have A LOT more than this. Cheers to some new finds! Below is a table of individuals and families who were enslaved by William Balfour (1770-1835), his son, William Lovett Balfour (1802-1857), and their family who lived and/or had plantations in: North Carolina Counties: Edgecombe; Louisiana Parishes: Carroll Parish and Feliciana; Mississippi Counties: Bolivar, Coahoma, Claiborne, Madison, Marshall, and Yazoo. Edmund 24 Male 1857 Homestead Madison County MS Estate of William Lovett Balfour Estate Inventory Value at apprraisal – 1200; Related to Rachel, age 40 from Homestead, Madison County, MS; Last name is Day. Melvina 19 Female 1857 Homestead Madison County MS Estate of William Lovett Balfour Estate Inventory Value at apprraisal – 1075; Related to Rachel, age 40 from Homestead, Madison County, MS; Last name is Day. Rachael 40 Female 1857 Homestead Madison County MS Estate of William Lovett Balfour Estate Inventory Value at apprraisal – 675; married King Atlas, Sr. in Carroll Parish – recorded 09/02/1867. Last name is Day. Richmond 45 Male 1857 Homestead Madison County MS Estate of William Lovett Balfour Estate Inventory Value at apprraisal – 835; Related to Rachel, age 40 from Homestead, Madison County, MS; Last name is Day.